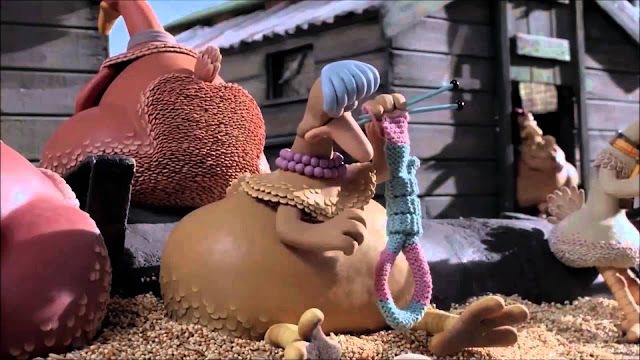 The thing that surprises me about Chicken Run, and it somehow manages to surprise me every time I watch it, is the way that the narrative so thoroughly rejects individual heroics in favor of rewarding collective action. 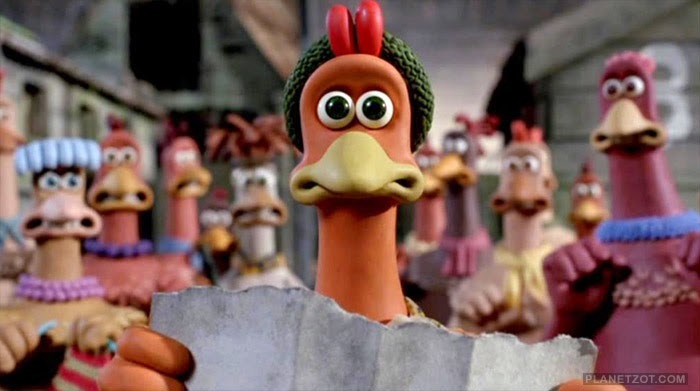 In other words, Chicken Run is a movie where no chicken is truly alone and while no chicken can fly on her own, together they can soar. That’s pretty fantastic, right? It’s a movie where the grand heroics involve everyone working together, and it’s a film that validates the traditional feminine pastimes of its heroines by showing that they can be just as useful in orchestrating an escape as any amount of bravado or “sheer guts”. Actually, more. And it’s also a movie that is incredibly brilliantly blatantly British. 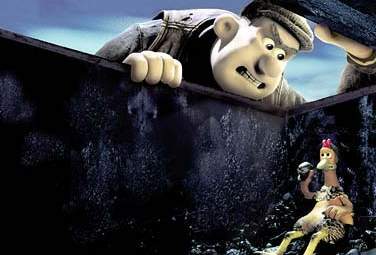 I don’t just mean in the sense that it was made by a British film company (the makers of Wallace and Gromit, naturally) and released in Britain, but in the sense that the ethos of this film, the structure, and even the movies that it’s mimicking so hilariously, are all British. It’s just a really really British film, and it exemplifies the best of that mindset. I mean, there’s lots of stuff about British post-War politics and rhetoric that is worth objecting to, but there’s also quite a bit that’s not. This is that latter part. The film is a parody/homage to the great British escape movies and war films, sure, but it also exemplifies what was so noteworthy in the actions of the British people during the war. The way that people pitched together to do the work that needed doing. The pragmatic, keep your chin up, carry on fighting spirit that was quiet but still very true. All of that, the humble and not-showy belief that all of us pulling together can make it through, that’s worth celebrating, and that’s a huge part of this film. So, you know, good. If you’re not familiar with it, allow me to give you a quick primer. Chicken Run, which came out in 2000, is a feature-length claymation film that is ostensibly for children but kind of in practice for everyone. The plot is deceptively simple. Our main characters are chickens who live in a chicken farm on the British countryside. It’s an egg farm and there’s a looming threat of death hanging over everyone – produce too few eggs and you get the chop. Ginger (Julia Sawalha), the hero of the film, is a chicken with a dream. She dreams that one day she and all of the other chickens will live free in the country, feeling grass beneath their feet and eating when they feel like it, no longer prisoners of the farmer and the farm. The other chickens love this idea, but are also more hesitant to buy in. 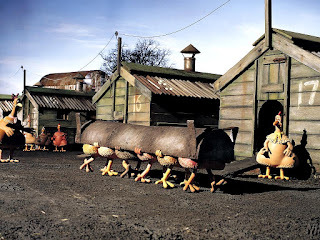 After all, being chickens on a chicken farm is all they’ve ever known. A life without fences? Sounds nice, but how the hell do you propose we get there? So Ginger keeps trying to help the other chickens escape, and her attempts keep failing. They do, however, catch the attention of the farmer, Mr. Tweedy (Tony Haygarth), who punishes her by putting her in “solitary confinement” in one of the empty feed pens. Yet every time Ginger gets out, she’s come up with one more plan to try to get them out. This is the status quo. If Ginger were thinking only of herself, she’d be well out by now. As the mastermind of all of these plans, Ginger is well able and practiced at getting out of their coop. But she’s trying to get every single other chicken out at the same time as herself, so it never works. Ginger wants to save these other chickens, so she keeps putting herself in danger. While she’s contemplating yet another new plan to escape, Ginger is offered a simple and easy solution to her problems. Falling from the sky – flying – she sees a rooster, Rocky (Mel Gibson). And here he is: living proof that they can escape by flying over the wall. Awesome! Rocky injures his wing in the fall, but Ginger figures that’s no big problem. Even with a wounded wing, Rocky can help them learn how to fly and by the time of the escape he’ll be all better. Win-win. At first Rocky’s not enthusiastic about the plan. He’s a “lone free ranger” who doesn't want to be tied down by a bunch of chickens and their mildly insane plans to escape their fate. He, frankly, does not care. But Rocky has his own problems. He's on the run from the circus where he was a side-act rooster. The exact nature of his act is something he carefully keeps hidden from Ginger and the chickens, but it's quite clear he does not want to go back. So that's the deal Ginger strikes: if Rocky helps them learn to fly, they'll hide him from the circus so he doesn't have to go back. And that's what brings us into the second act. Rocky commences teaching the chickens how to fly while Ginger works on perfecting the plan. There are the usual silly personality clashes. Ginger is selfless and kind and determined to help the others - she finds Rocky's egotism and womanizing ways to be kind of offensive and unnecessary. Meanwhile, Rocky is a playrooster who loves the attention he gets from all the hens - he thinks Ginger is stuck up and stiff-necked. Obviously they're going to fall in love. That's definitely the weakest part of the film, its insistence on writing in a romance between Ginger and Rocky. The movie really does not need it. 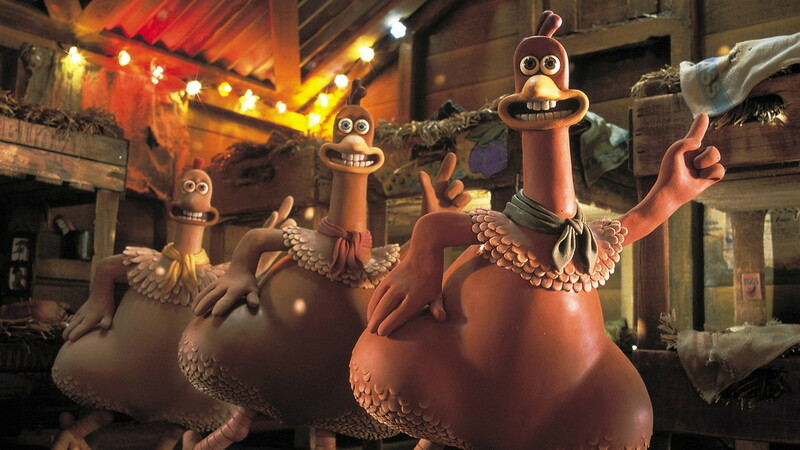 For our actual tension throughout the second act, we have the escalation of the danger the chickens are in. Frustrated by the meager profits afforded by her husband's chicken farm, the terrifying Mrs. Tweedy (Miranda Richardson) has decided to transform their business. They will now be a farm that sells chicken pies, not eggs. To aid them in this, she has bought a gigantic, frightening chicken pie machine which turns nice live chickens into pies. Yikes. So clearly this is not a film for the faint-hearted child. Our heroes are the chickens and there's an entire frightening sequence when Ginger and Rocky are forced to escape from the giant machine. They sabotage it in the process, and buy themselves some time, but it's clear the stakes are pretty high. By the end of act two, we know a couple of things. First, we know that chickens cannot fly (and the chickens themselves are starting to figure that out). Second, we know that Ginger's plan to escape will not and cannot work. And third we know that the truth about Rocky - that he can't actually fly - will come out sooner rather than later. Naturally all of this comes to a head at the same time. On the morning that Rocky is supposed to finally finally give the chickens a flying demonstration, Ginger wakes to find his bunk empty and a piece of paper in his place. It's the bottom half of a poster she saw earlier that featured Rocky flying. The bottom part of the paper shows that he wasn't flying, he was being shot from a cannon. Ginger is devastated. Their plans are over. This causes the hens to fall into a despairing chicken-fight, but before the moment can linger too long, Ginger has another idea. They can still fly, they'll just have to fly together. See, throughout the film we've been hearing bits and snatches of stories from Fowler (Benjamin Whitrow) about his old RAF days. As the chickens slowly realize, RAF stands for Royal Air Force, and that means that Fowler really did fly once upon a time. Just, you know, in a plane instead of with his wings. So Ginger and Mac (Lynn Ferguson) come up with a new and better plan where they all work together to transform their chicken coops (the "huts") into a mechanical airplane powered by chickens peddling little stationary bikes. Yes, it's kind of silly and ridiculous. But it's also lovely. The chickens use their already established skills to sew and knit and manufacture this plane. They make it themselves and when it's time to get away, they escape because they all work together to fly it. And that's what I want to get at in this film. That's what I consider so wonderful about this movie. Yeah, it has a typical Hollywood ending where Rocky comes back and helps them escape and he and Ginger reconcile and the Tweedys are defeated, but it also has a resolution that seems resolutely contrary to the usual fare. The chickens succeed because they work together. The plan doesn't end up being something that Ginger develops on her own, she doesn't "save" everyone. They save each other. Plus, instead of forcing the chickens to be something they're not, the plan that ends up saving them is one where they each use their skills to help each other. Mac is a brilliant mathematician and engineer, so she makes the plans for the plane. Ginger organizes everyone because she's a born leader. Bunty (Imelda Staunton) is a great egg-layer so she lays eggs they can use to pay the rats who get them spare parts they need for the plane. Even Babs (Jane Horrocks), a notoriously ditzy chicken who is a punchline throughout the film, gets her moment when she heads up the team doing construction of the wings. Everyone has something to contribute, the movie says, and you don't have to be anyone you're not in order to help. It's a validation both of traditional feminine work as well as a spirit of cooperation that is generally not common to Hollywood films, especially films for children. And as for the story being a little too dark for kids, well, you all know by now that I'm not a big proponent of things being "too dark" or "too scary". I tend to think that a little dark and scary is good for kids. There's just...it makes me really happy. It makes me happy to watch a movie that is about female characters orchestrating their own salvation from oppressive forces. The danger is real and present and their victory over it is their own in the end. It's fantastic. Because the message that this movie sends is that there is no one right way to contribute to your community. And it also makes it clear that the greater virtue is not escaping on your own, it's escaping in such a way that you can help everyone, even the ones who told you not to bother. It's a very practical application of kindness, and I'm generally of the opinion that films could use more of that. I mean, it's a film that validates ideals of sacrifice and selflessness and courage in the face of very real danger. It shows that sometimes the world is big and scary and sometimes the forces set against us are much bigger than we are, stronger and with more power. But if we work together, we have a chance. 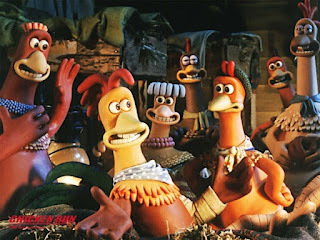 And, in a very true sense, the heart of the movie is when Ginger asks the other chickens how they want to die: because they gave up or because they tried to be free? 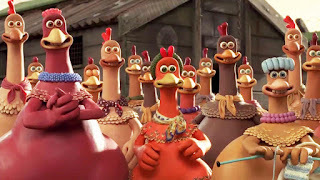 It's a movie with a female hero and a female antagonist, a movie about chickens that somehow manages to have more heart than most kids' movies about humans. And all the while it manages to be hilarious no matter how old you are watching it. What more do you want in a movie? There's also some very literal gallows humor and it's great. It's also worth mentioning that this is an especially quotable movie, a distinction that few children's or family films truly earn. Babs: Morning, Ginger. How was holiday? Ginger: I wasn't on holiday, Babs. I was in solitary confinement. Babs: Oh, it's nice to get a bit of time to yourself, isn't it? Babs: I don't want to be a pie! I don't like gravy! Mrs. Tweedy: It's a pie machine, you idiot. Chickens go in, pies come out. Ginger: Listen. We'll either die free chickens or die trying. Mrs. Tweedy: You are going to be a PIE! Babs' "I don't want to be a pie! I don't like gravy." runs through my head literally every time I see a pie. Which is definitely a sign of how memorable this film is, I agree.